What Is The Best Choice For A Truck Gun? Home What Is The Best Choice For A Truck Gun? Well, first of all, what is a truck gun to begin with? In short, a truck gun is a gun that you, well, keep in your truck. Most of the time, it refers to a rifle or a carbine weapon. Whenever you’re out in the woods and need to do some shooting at a moment’s notice, the truck gun is the gun you would be guaranteed to have available. That being said, you can’t just toss any rifle in the back of your truck and call it a truck gun. Okay, you technically can, but that’s not the smartest move. There are certain rifles that will be a much better choice for a truck gun than others, and we’re going to talk about those rifles today. We’ll focus on the qualities your truck gun needs to have, and then examples of truck guns that have those qualities. But first, we’ll answer this question: is having a truck gun even necessary to begin with? 1 Is Having A Truck Gun Truly Necessary? 2 What Qualities Does A Truck Gun Need To Have? Is Having A Truck Gun Truly Necessary? In a word, no, it is not. In fact, an argument could be made that not only is it not necessary, it’s simply not wise. If you keep a gun in your car at all times, what happens if someone breaks into your car and drives it away? That’s right, they take the gun with it and now have access to a firearm that could be used for criminal purposes later on. At the same time, there’s no denying that a truck can be very useful. If you’re out in the woods or the boonies or wherever, and you need to defend yourself, go hunting, or just want something to shoot for fun on a moment’s notice without any real planning, a truck gun will certainly be very handy to have. At the very least, it gives you peace of mind that you have a rifle with you even if you don’t need it right away. So while a truck gun may not be necessary, it certainly can be very useful, and that alone is reason enough to consider having one. What Qualities Does A Truck Gun Need To Have? 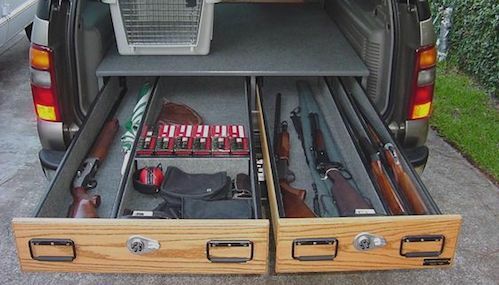 Shorter rifles are simply easier to store in trucks such as under the seat. They’re more wieldy, don’t take up as much room, and are simply more portable. A shorter, carbine-length rifle will be much more desirable as a truck gun than something longer (or heavier). Your truck gun needs to be capable of being used for a wide variety of different tasks, whether it be hunting, defense, or just casual target shooting. Since your truck gun may need to be used for hunting, it needs to fire a round capable of bringing down large game. At the very least, your truck gun should be powerful enough to bring down a deer. Your truck gun needs to have a durable build and finish. After all, if it’s going to be secured in the back of your truck under the seat or wherever, it’s going to accumulate a fair amount of wear and tear. If you have all the money in the world to spend then this shouldn’t matter to you, but ideally, your truck gun should be an inexpensive rifle (as it’s simply a gun that you toss in the back of your truck and forget about until you need it). Even more important than your truck gun not being expensive is it not being sentimental value. Your truck gun is going to accumulate A LOT of dings, scratches, and general wear on the finish, and therefore it shouldn’t be a rifle that you care about deeply. Your truck gun doesn’t need to have every single one of the above qualities, but it should have as many of them as possible. Inexpensive but reliable AKs such as the WASR-10 are a good example of a truck gun assuming you want a semi-automatic rifle with a large magazine capacity. The 7.62x39mm round is capable of bringing down deer (power is roughly similar to that of a .30-30), and the capacity of 30 rounds makes it a good choice for defense. The AK is also a carbine length rifle and should therefore fit in the back of your truck. You may prefer the AR-15 platform over the AK, and if so, there are inexpensive AR-15s such as Del-Ton or the Ruger AR-556 or Smith & Wesson M&P15-II. The 5.56x45mm NATO round can be used for deer, and a capacity of 20-30 rounds or higher makes the AR-15 a good defensive choice. As with the AK, you should have no problem fitting the AR in the back of your truck. The Marlin 1895 is a big bore lever action rifle chambered in .45-70, which is capable of bringing down just about any big game in North America. Price is on the higher side but you can find used models for cheaper. If you want a no-nonsense, big bore carbine for your truck gun, this is the way to go. Lever actions are naturally a good choice for truck guns because they are short, light weight, narrow, portable, and have a faster rate of fire than bolt actions. That being said, the .45-70 like we just discussed is a very big round with a lot of kick, and if you would like something lighter the Marlin 336 is an excellent option. Routinely available for around $400, the Marlin 336 is the second most popular sporting rifle in American history, and the .30-30 round it fires has most likely killed more deer than any other caliber. It also has a notable advantage over the competing Winchester 1894 in that the spent shells eject out of the side, which gives you the ability to mount a scope and reduces the possibility that an ejected shell casing will strike you in the face. The Mosin Nagant M38/M44 carbine is perhaps the epitome of everything a truck gun should be: short, durable, inexpensive, unsentimental, and capable of bringing down big game. Yes, it is a bolt action with a slow rate of fire, which means it’s not the best choice for self-defense. But the 7.62x54r round can be used for anything in North America, and Mosins are well known for being cheap and yet highly durable rifles (though prices have been rising in recent years and will continue to do so). Yes, the Ruger 10/22 is a .22 LR and not exactly the best choice for game hunting. Even so, there’s no denying that the .22 is a highly versatile round, which is why you shouldn’t entirely disregard it for your truck gun. The .22 is an excellent training, plinking, and small game hunting round, not to mention it can be bought in bulk on the cheap. The 10/22 is one of the most customizable weapons on the planet, and the Takedown model easily splits into two pieces that can be stored in a given backpack before being reassembled. If a .22 rifle is your idea of a truck gun, the 10/22 Takedown model is arguably the best choice. The bolt action Scout rifle concept popularized by Jeff Cooper is another naturally good fit for the role of the truck gun. It’s short, light, has a detachable box magazine for quicker reloads, and fires a full powered round in the form of the very popular .308 Winchester. The Ruger Gunsite Scout rifle (GSR) is a pricey weapon at around $800, so it’s not exactly the best option for the budget minded. But on the other hand, you’re also getting a lot of gun for the money: high quality 5 or 10 round magazines, a Picatinny rail with the option to mount a scope forward of the receiver, a laminate wood stock or black synthetic stock depending on the one you prefer, a three position safety, and a smooth Mauser action. Another good semi-automatic rifle like the AR-15 or the AK-47 will be the Ruger Mini-14 carbine. Chambered for 5.56x45mm NATO/.223 Remington (or 7.62x39mm in the case of the Mini-30), this is a lightweight and reliable rifle that will naturally lend itself to being a good truck gun that you can keep under the seat and be used for either defense or hunting deer-sized game. As with the GSR, the Mini-14 is not a cheap rifle. Brand new, expect to pay around $700 if not a little more. Do you want a .308 carbine like the GSR but also want it to be a semi-automatic? If you’re willing to put down the cash for it, the Springfield M1A Scout is without question the best choice. The M1A Scout is simply a shortened version of the full size M1A. It fires from a detachable box magazine that typically holds 5, 10, or 20 rounds. The M1A can be used for defense or for hunting, and the .308 Winchester round it fires means it can tap targets at much longer distances (and with more power) than the 5.56x45mm NATO or 7.62x39mm can. The M1A is also a very costly gun, and any of the three primary variants of it will cost you around the $1,500 mark, give or take a couple hundred dollars depending on where you buy it from. Is it worth it that much for a truck gun? That’s up to you. The Winchester 1894 in .30-30 is the most popular sporting rifle in American history. It’s possible that the 1894 has killed more deer than any other rifle ever made (though the Marlin 336 no doubt comes close). As a truck gun, the 1894 is a good choice because of its balance, lightweight, portability, its faster rate of fire than bolt actions, and its ability to bring down medium sized game such as deer. New 1894s are very expensive, but used models in good condition can be found floating around the market for a few hundred dollars. What is the best truck gun? Honestly, the best truck gun is any unsentimental gun you have that you’re willing to toss away in the back of your truck and forget about until the time comes to use it. You may already have a rifle in the safe that fulfills this role. But in summary, your truck gun should be light, short, versatile, durable, and have little to no sentimental value to you. Any one of the rifles we have just covered today meets either some or each of that criteria.